We see a lot of working pods, collaboration and break out spaces in the modern workplace. Those are places where people engage with each other. However employees still need a place to sit down and concentrate on the task at hand. Therefore the individual workstation is still a crucial part of the workplace – and so is the task chair. 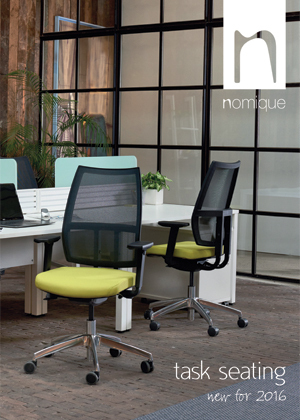 At Nomique we understand the importance of a good office chair. That’s why we expanded our task seating portfolio and reviewed some of our classic products to improve them even more. With new ergonomic features and ease of use our task seating can help to boost productivity in the workplace. You might already be lucky enough to have a copy of our new task seating brochure which gives a full description of all our brand new features and options. 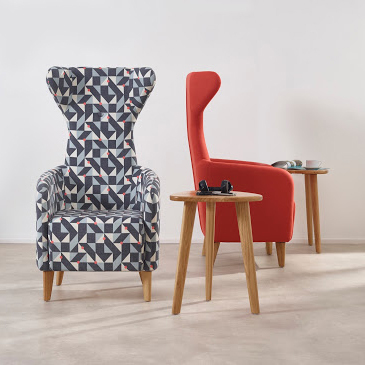 With changes to mechanisms, alterations to seat width, as well as entirely new chairs, Nomique really do supply a chair for everyone and every space. You'll also find lots of beautiful new photography to help you choose which chair would be your favourite to work in. Or if you can't wait that long for one to arrive then please have a look at our website where you'll find more in depth information and specifications, as well as high resolution images for download. It's not long now before you'll be able to visit us at one of our fantatsic launch events across the UK. Where we'll be showing off our brand new products as well as a few products that never get old. There will be demonstrations, funky fabrics, new literature and a chance to meet the Nomique team, to have a chat over a hot cuppa. We suggest that you follow us on our social media pages (find links below) and careful sort your through your post because an invite will be on it's way to you very soon. Not only are we releasing new products, a new website, new literature and new photography but we are also keen to try new things. Just like our new Lux Video that will be release on Monday, keep an eye on our Youtube channel to be the first to see it, or follow us on social media (click the links below). Happy weekend and happy chair shopping!